Order in 2 Hours 55 minutes 16 seconds for dispatch today! These are very light overtrousers which pack down small. The hook and loop bands on the calves are a stroke of genius that allows the trousers to be cinched in almost like gaiters. I did find that the waist elastic was quite tight (I am 34/36" waist and got the large size) so a larger size may be best. The breathability is good but I did find that like most 'breathable' fabrics they were overwhelmed on a day of continual rain and became quite sweaty after a couple of hours. The fabric dries very quickly. 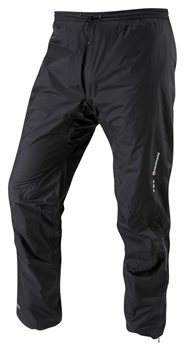 How can I repair a rip in my waterproof trousers?